If you are pregnant, consult a qualified aromatherapist before using essential oils. Do not apply essential oils directly on the skin, unless specifically directed. Essential oils may cause skin irritation, especially on sensitive skin. Essential oils may stain or damage wood, upholstery or fabrics if spilled. Essential oils are flammable; keep away from flames. Aromatherapy combines the emotional and physiological properties of gentle massage with the medicinal mood enhancing properties of essential oils. It alleviates stress and can energize your spirit. Aromatherapy has also been known to stimulate the immune system and relieve sinus pressure. Aromatherapy is popular for both massage as well as spa applications. Whether added to a lubricant, or inhaled using a diffuser, the benefits are many, while the expense is minimal. 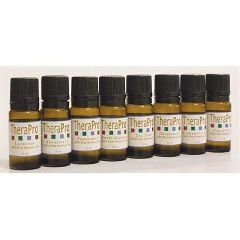 Our TheraPro Essential Oils are carefully selected from around the world and packaged in glass containers. Available in 10 ml bottles. Prices vary.